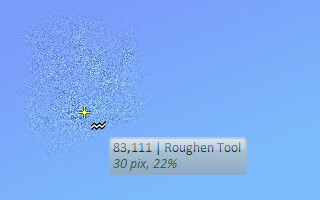 This tool "roughens" the area around it. Just hold the left mouse button down and drag. This tool can be used create the rough look of the sands of a desert, the floor of a building, an unfinished wall, the leaves of a distant tree - just about anything rough. You can set how much roughening to apply by setting the tool effect level, and the size of the tool's tip by setting the tool width. Using this tool requires some practice, so make sure you get lots of that. To change the tool width and effect level (strength), use the width and level entries on the toolbox. This tool is pressure sensitive when using a graphics tablet; the pressure varies the intensity.